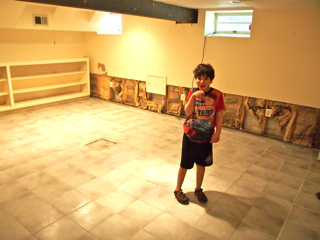 Love That Max : Our basement renovation: crowd-sourced decorating! Weigh in! Our basement renovation: crowd-sourced decorating! Weigh in! Therapy has been a part of Max's life since he was a month old and Early Intervention started. Usually, the therapists and Max hang out in our basement. It's important for him to be someplacer quiet, so he can focus. But the basement's never been an ideal area for therapy, mainly because of the open shelving filled with toys that distract him. There's also no dedicated place to keep therapy stuff, like this giant plastic ball he uses and other stuff, and no wide open area for him to do more physical stuff during therapy. 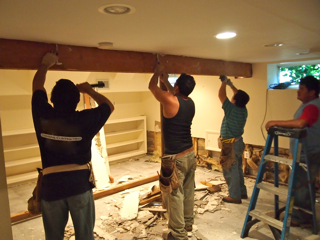 Also: After the basement got flooded during Irene last year, we had to tear out the bottom part of the sheetrock—not the most attractive look. And so, we've been faithfully contributing to our Basement Renovation Fund and finally saved up enough to get the work done. Some companies are contributing stuff, which is rather awesome, including IKEA, Pottery Barn Kids, Lowe's, Whirlpool and Sherwin Williams. First up: get rid of the column smack in the middle of the basement that you can see up above. It's called a lally (I am getting to be quite the construction expert). 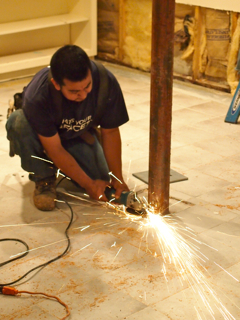 We used LallyGone, a company that specializes in lally removal from basements and garages. It's run by George Nader, a structural engineer, and his super-nice wife Elizabeth. Basically, the crew removed the sheetrock around the colun, screwed in gigantic pieces of metal on both sides of the beam for support, then removed the lally. After! See something missing here? Now we basically have a raw space that needs to be sheetrocked again, a floor that needs covering, walls that will need painting and lots of ideas. I've started a Pinterest board with potential paint colors, furniture, cabinetry and flooring. The flooring, I'm sure of: I want a dark-ish brown one, and I found a beautiful kind by Mannington (you'll see it's on Pinterest—looks like wood, actually vinyl). I'm also definitely getting the simple-yet-stylish IKEA Besta cabinetry; you can design your own. A few panels will have glass, and the rest will be an out-of-sight-out-of-mind place for toys and therapy equipment. • We're going with yellow paint, something warm from Sherwin Williams' new Emerald line, which is zero VOC. So! Many! Great! Yellows! I loaded my faves onto Pinterest. Then I painted my three favorites on the part of the wall that still has sheetrock. 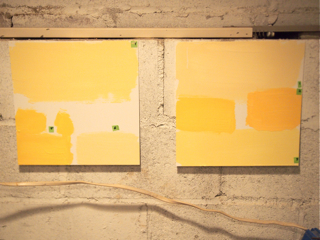 From left: Sherwin-Williams Solaria (6688), Friendly Yellow (6680) and Lantern Light (6687). I'm leaning towards Solaria (bold and rich) or Friendly Yellow (lighter yet still warm); Lantern Light is too lemony for me. But then I was concerned I'd get tired of a yellow so bright. I asked Max's opinion and he suggested "Cars 2"—as in, decorate the room with Lightning McQueen and Mater (I was surprised he didn't ask for purple, but his Cars movie obsession is going strong and the purple one seems to be dwindling). Sabrina and a friend over for a playdate examined the colors, declared "Polka dots!" and cracked up. Dave's non-answer: "Well, I usually go for bolder colors so maybe Solaria but then I can see why you like the lighter one. The right answer is whatever you like!" SO... I'm stuck. Do I own the yellow and go bold? The lower half of the wall will have wainscoting, so it won't be all yellow. Or do I play it safe with the lighter shade? • Seating: I'm gong with IKEA's Ektorp Love Seat and Sofa. Do I get the blue pinstripe (the fabric seems much more practical with kids), or go neutral with beige or white? The white Ektrop sofa (I Googled around, people seem to love it) has a machine-washable slipcover; a new one runs $99, so it's not that expensive to replace. The other covers are dry-clean only. Advice/thoughts on paint and sofa colors welcome! I think the Friendly yellow is more versatile should you wish to change things up a few years down the road. And I'd avoid anything beige or white when it comes to kids and grunge and spills-blue definitely. Great project, and happy Thanksgiving!! Love Ektorp style...I would say blue pinstripes unless the kids will be forbidden to eat on a white/beige couch. (Yeah, right). Even if the cover is machine-washable, it does not mean the stains will be easy to remove. We always say: "it's only paint"! Repainting is inexpensive and easy if you get tired of the colour. We have a strong yellow in our office, and I love it. Never fails to lift my mood! Hi. What a fun project. 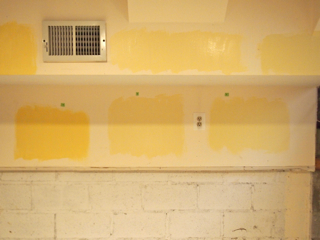 Regarding the paint, what about painting all of the walls the middle yellow color, but then doing a "wash" of the darker yellow on one wall? I did that in my office and love it. It was super easy. You just mix the paint with water, get some cheese cloth, and rub it on the wall. I did sort of a marble-type pattern, but you can do squiggles, x's or whatever. Just a thought! It actually took much less time than painting, too. If you're interested, I can send you a photo of my wall. Have fun with it! Paint one of the walls purple. After all, it is a Max space. 1. Love the bold yellow. Go for it. 2. Wow I would never place a fabric covered sofa in my basement. Kids, food, drinks...Yikes! I did a leather and never regretted it. Spills and crumbs get wiped off easily, not mashed in. Machine wash or dry clean stains often will not come out. But maybe your kids are neater than mine. I love the cabinets, and the flooring! I also agree with the others about avoiding a light coloured sofa, my kids have destroyed lightly coloured quilts and comforters, very annoying! You want to enjoy the space, not babysit it! I was thinking about an accent wall in a different color like purple or something else. I like the Friendly Yellow. Our living room is going to be a tan or light gray. Our basement tv area I am not sure what it is now. It is not on our re-do list right now. We are painting the living room, & all stair ways first before anything else. I love the friendly yellow. We painted a nursery yellow and it was so bright and cheery in the morning.. I loved it. Looks like a lot of fun.. creating. I say keep the walls and furniture neutral, the dark floor will look nice and accessorize with bright pillows and walls stuff. That way you can change the look more often if you so desire. I'm a plain wall kind of girl but I LOVE colorful accessories. PS - my whole house is basically lantern yellow. Hi. So since you are putting so much thought into this, and it is a work space for Max in part, I think you should consider the feng shui, or if you are not into new age, then shall we say industrial psychology aspect of colors. Seriously, there is good evidence that color affects mood, so for instance green is calming and focusing. So I think, as I said especially because you are giving this so much thought, you should consider this aspect as well. What an incredible renovation! I suggest testing the paint colors during different times of day -- basement rooms are usually lit with non-sunlight which can really change things. As for the actual color...I say go with your gut. I really love the polka dots idea. You could get playful with that and use a stencil and your favorite yellows, and maybe some purple or (cars) red as well. That said, I think any of those yellows would work above a crisp white wainscotting. We painted our laundry room Behr Pineapple Soda and it's this great cheerful punch of color in the first room we enter when we enter through the back door (which is 95% of the time). It manages to look sunny even when it's a Chicago winter, dark and gloomy, and there's clutter and horribleness all over the room. Hi Ellen: Solaria would be my choice. It's not too bright, but it's dark enough to not be mistaken for dirty, yellowed walls. But would the brighter Solaria be a distraction for Max? As for the couch, washable covers are a nightmare. They never come out of the wash the same. Leave the cleaning to dry-cleaning professionals. A side thought: if you plan to someday have your bedroom blue and yellow, those two rooms in the same color palette might get boring. Yellow is really tricky to get right. In my experience, yellows looks brighter (and not in a good way) once you have the entire room of it. I have ended up with rooms that looked neon bright, when I wanted a softer look. I would go with Friendly Yellow. Partially because of the shade, and partially because of the name. It's friendly! 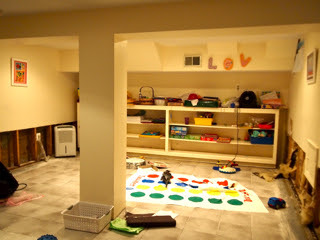 Now I want to renovate my basement. That looks amazing! Can't wait to see it finished. Great project! I love the bolder yellow, the dark timber look floor and a fabric on a sofa that can be wiped/washed! Looks like a great space! Funny! I just painted my Emma's room, the entire room, the Friendly Yellow by SW. Emma is obsessed with yellow, so she loves it. Her room has a very tall, vaulted ceiling, and it really seems to work. We used a darker flooring, a hickory color. I actually really like it with the darker flooring. The nice thing that I have found with the SW paint that is that it is pretty true to color. 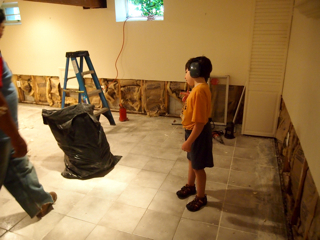 I have done several rooms recently due to remodeling and making our home accessible. I have used a variety of colors from beige to toasty brown and morning sun. They have all been exactly what I expected. I really think that you would like the Friendly Yellow, as it is a nice compromise between the two. With the wainscoting, I really don't think it will be over the top, especially when you start filling the room with other things. Just my opinion. I is a color that will definitely add some perk to a mood. Just my opinion and experience with the color Friendly Yellow and SW paints. I say go bold and embrace the Solaria yellow. It's a basement, so you need to go a bit brighter than your instinct might suggest. As for Cars, I swear by the vinyl decals someone suggested above. I've used them to make an under the sea nursery and a space shuttle/space bedroom. They are fairly easy on and when the time comes-easy off. You can even but some purple (or other color) polka dots (or other shapes). As for the couch, of you can't go with leather, at least go dark. FWIW- I also did our therapy room in bright yellow with blue and yellow striped curtains and dark wood floors. Paint it cream yellow. Mustard yellow is not sensory friendly. Go bold or go home. 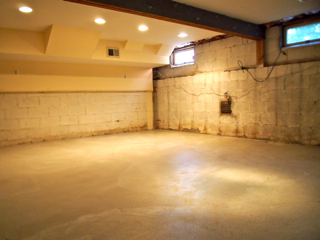 Basements need all the help they can get as most are dark. I am just envious of your basement with a post in the middle of the floor. Go with the lighter shades. Don't go with the bold yellow--it will bother you at some point. You want a bold color, put a giant painting or poster up with the color--you can take it down if you get sick of it. Also--think resale. You may get an opportunity to move to some exotic land, and a blaring color ain't good for resale. As for the couch, get WASHABLE slipcovers--don't even think twice about you. Come on, you know all about power puking! We all do! Zip and wash! Can you imagine having to dryclean that stuff? Ewww! Ellen -- My friend just painted her living room friendly yellow. It's beautiful! It's sunny and warm, but not too bright. You'll have plenty of other things in the room to add a punch of color. Go with friendly yellow! What a great renovation on the basement. I think "Friendly Yellow" will suit your basement better than the other two as its color is not too bright but looks fresh and cheerful. Hope you found a great choice for it. All the best!